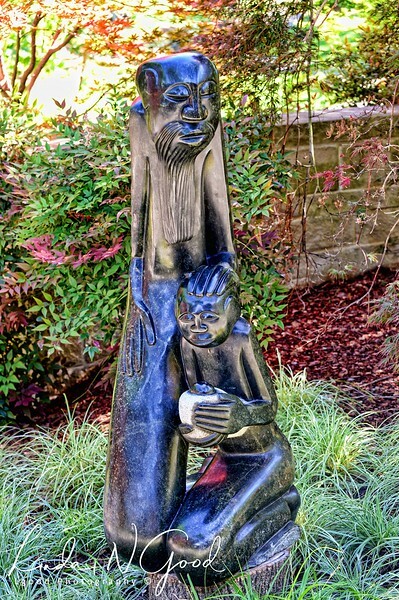 The title of the Zimbabwean sculpture is “Responsibility”. The artist is Justice Babhama. The medium is Serpentine, which according to a Google search, is not a single mineral, but rather a group of related minerals. Besides the main members of Antigorite and Chrysotile, as distinction is not usually made between the individual members except under scientific study and classification. It is most often the mineral is a dark green color and is sometimes mottled or spotted like a snake’s skin. This was a part of the ZimSculpt exhibit at the Dallas Arboretum several years ago. I really liked it and I think the title really fits. To me, it looks like an elder is proving a teaching moment to a young person. Find the artist inside of you today. Very unique sculpture Linda, beautiful shot! I have really enjoyed all the sculptures from that ZimSculpt display you have shown over the years. This is another great one. I have always liked that Michelangelo quote. Awesome photo, well done Linda. Terrific capture of this sculpture with all its details. Beautiful piece of art and capture! I think I missed this one!